If you are looking for information on the Express Train Fitness for Men franchise business opportunity, Express Train Fitness for Men franchises or Express Train Fitness for Men franchising, then you have come to the right place. 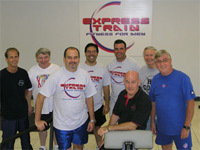 Express Train Fitness for Men provides a quality, effective exercise and weight management program in a clean, hassle-free environment. The program is flexible to fit the individual needs of our clients, based on their physical make-up and lifestyles. 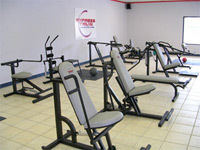 Our program allows the client to effectively achieve their individual goals with a 30-minute circuit training routine. The end result promotes good eating and exercising habits as a lifelong lifestyle change. We do not advocate quick fixes, instead, we encourage long-term, permanent lifestyle adjustments through gradual changes. 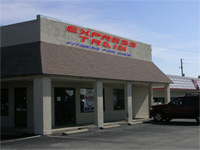 Express Train Fitness for Men has a franchise fee discount program for those who wish to purchase multiple locations. The total investment ranges from $73,600 to $130,000. The franchise fee includes 9 hydraulic machines (with the Express Train Fitness for Men logo embroidery) and 6 cardio stations for a 15-station circuit training system. You will also receive other items such as heart rate monitors, body fat tester, stationary, music cues, wall charts, training, a comprehensive operations manual, opening banners and promotional items for a grand opening. The on-going royalty structure at Express Train Fitness for Men is such that we are successful only when the franchisee is successful. We have a stake in making sure that you continue to grow and prosper in your business. Franchisees receive three days of comprehensive training at our corporate facilities outside of Orlando, FL. Everything needed to run a franchise will be covered from daily paperwork to complete exercising and nutrition programs. There will be a pre-opening and Grand Opening team to help start you off on the right track. Marketing support will be provided to ensure continued success.